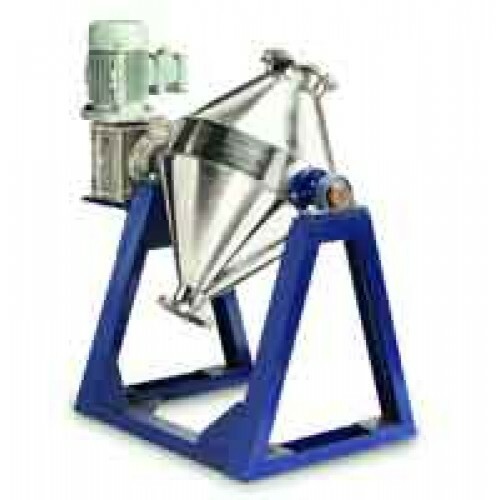 The Double Cone Blender is efficient and versatile equipment for homogeneous mixing of dry powder and granules. 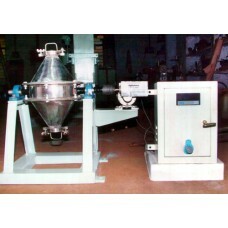 This blender achieves absolute homogeneity in the blending of a wide variety of free-flowing, dry materials. This is accomplished even with dry materials, which are dissimilar in particle size and shape, because the double cone design interfolds the material regardless of its flow properties. Blender rotates, the material at the sides nearest the axis starts to cascade first, striking the sloping sides of the cone where it is deflected toward the centre. The progressive cascading action moves material from the smallest axial radius and toward the centre. The speed of the unit determines the point of rotation at which the material starts to cascade. A second action takes place simultaneously with the cascading action. Material falling into the middle of the blender spreads apart as it falls, mixing with the material flowing inwardly from the sides. 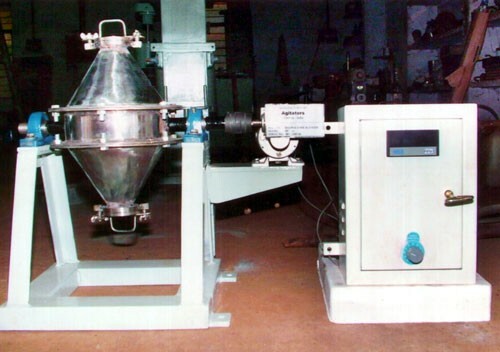 The double blending action is so rapid and effective that particles of different physical properties cannot separate, and are interspersed uniformly throughout the batch.